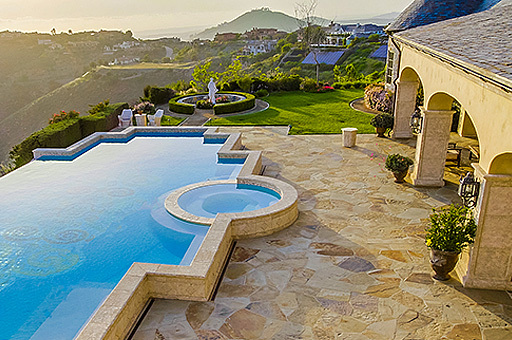 This unique custom San Diego estate was built to resemble a 15th Century French Chateau. With its Old World Architecture, this 4 Bedroom, 11 bathroom estate is truly one of a kind. The 12,000+ Square Foot home includes an 11 car garage, guest house, a wine cellar, 3 built in bars, theater, and anything else you would need making it an entertainers paradise. As you enter the property, a massive hand forged wrought iron gates lead to a 500-foot driveway made up of 150,000 cobblestones. A fixed drawbridge over a moat leads you into the entryway through a massive distressed wood front door with custom designed hand forged hardware lead to the opulent living room with 25ft ceilings. From the enormous patio and backyard paradise, you can see Mexico, Coronado, Catalina Island, Downtown, and La Jolla with extensive 180-degree views of the Pacific Ocean. Every detail was thoroughly thought through including the reclaimed wood beams which are from an old barn in Canada, the flooring is the biblical stone from 1,000-year-old roads torn up from Jerusalem, and the walls, arches, and fireplace are all made of hand carved limestone.